This pub is set in a fantastic Dales location. It's off some of the main tourist drags. So it was considerably quieter than other Dales pubs we visited. It overlooks the village green and there are a number of tables on the edge of the green to enjoy the views and the peace and quiet. The interior has a narrow bar and a number of small rooms. Landlord & Boltmaker were the 2 ales on handpull. There was no sign of a jug. So maybe the landlord has stopped serving direct from the jug now. Stunning location. Not sure about the pouring of the Landlord from a jug. Probably the worst pint we had on a 26 pub walking holiday on the InnWay. We spoke with quite a few locals who we also not fans of this technique. Still, the pub is so wonderful and unchanged its a must visit. Glorious. 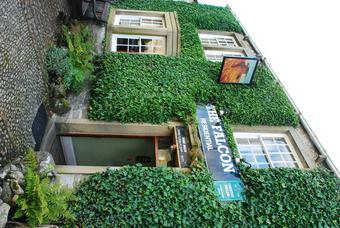 I've been going to The Falcon for over 25 years.....it's sinply a wonderful place....and yes the landlord is very direct......he's also very well informed about an enormous range of subjects....has a deliciously dry sense of humour....is a true man of the dales....and he does'nt suffer fools gladly....and why should he....just look in the guest book to see how truly popular this place is. Well worth a visit for the experience alone, let alone the wonderful Timothy Taylors beer......for all those who've reviewed on this site wishing for a more 'modern' experience may I suggest you go to your nearest Weatherspoons!!!!!! Visited this pub on Sunday and had a great evening. After hearing all the bad reports on this site and others we expected to find the pub closed or the landlord to ruin our evening. However, it wasn't the case! After walking the 2/3 miles along the river from Hawkswick Cote campsite we found the pub open (open until 10:30pm on a sunday). Our first impressions were that we felt we'd gone back in time but felt that it was definately worth going to. We ordered 2 pints of Taylors best bitter (came to about �2.60 a pint which was the cheapest we'd had all weekend in the area) and sat in the back room with the stuffed animals on the wall. Apart from us there was the odd local who came in for a pint or two. We pretty much had the pub to ourselves. A couple of times the landlord would have a chat to us and ask us where we'd come from. He was particuarly interested in our studies and told us about his two kids aswell. We didn't have food but there was a kitchen to the right of the bar. In our view, we had a great time and didn't find the landlord rude at all. If anything, i just think some people just don't get Northern people! A great Dales experience. Will visit again!